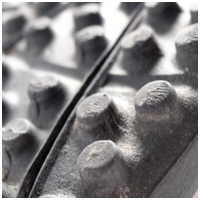 Soft ground boots (SG) consist of screw-in studs or blades and are ideally suited for use on soft natural grass surfaces, mainly through the winter months. Firm ground boots (FG) have moulded studded or short bladed outsoles which can be used on firm natural grass surfaces that have become too hard for a traditional stud or long blade to sink into. These boots would be used through the spring/summer months, pre-season or end of season. Hard ground (HG) boots are for very hard natural surfaces. These outsoles will have a multiple stud configuration which consists of short low profile rubber studs which are very close together and normally will cover the whole sole, again these are non removable. This boot should be worn on pitches where there is very limited give in the surface. This is unlike firm natural surfaces which still has a reasonable degree of softness to allow a stud to sink in. These Hard ground boots are also suitable for Astro surfaces. Studs, moulded, blades, soft ground, firm ground, confused? The last five years have seen an explosion in grassroots football with over five million youngsters registered across the country. This explosion has also seen an extension to the normal playing season with the introduction of summer tournaments, fun days, summer soccer schools, development centres and even football tours abroad! Football has now become an all year round sport, which also means climate changes and different playing surfaces. Players should always wear the most appropriate type of boot to coincide with the type of ground they will play on. Flashy, fashionable boots may look good but will they do a satisfactory job on a particular surface? 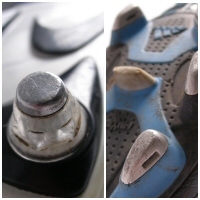 The type of outsole (bottom of the boot) will have a direct effect on the function of the foot and should be a major consideration when playing. A good boot should give you support, stability, grip and traction allowing the player to perform. These outsoles fall into three categories: soft ground, firm ground and hard ground. Boot uppers are made from many different materials but usually leather or man-made synthetics. In some cases the upper will consist of a mixture of the two. Leather can mould to the shape of the foot better and be very comfortable with a realistic feel to the ball. However, leather can also stretch when wet and sometimes becomes too soft to provide any protection. Synthetic boots are generally cheaper than leather but , with modern materials such as synthetics, boots now have the ability to let the foot breathe through the fabric, therefore reducing sweating, making the boot more comfortable to wear. The position of laces can also vary greatly, from the traditional top of the foot position to running down the side of the boot. Apart from being fashionable there are two advantages with the laces moved to the side of the boot. Firstly, it gives the top of the boot a bigger, flatter area in which to control and strike the ball; this is known as the sweet spot. Secondly, it removes pressure from the top of the foot, which has a multiple of criss-crossing small nerves running over the top of the foot. It could be argued that on a child's boot, the top of boot would require more protection as their feet would still be soft and still developing solid bone structures, this would mean they would benefit from a traditional style boot, with padded tongue and laces positioned at the top of the boot. 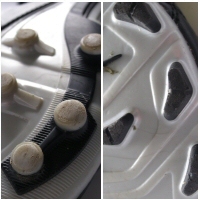 A young child starting out in football may want to consider a Velcro boot instead of a lace up. These boots are great for youngsters looking for independence or who have trouble doing up laces. All surfaces are different of course. Our British weather is very changeable, making the surfaces we play on very changeable too. If you are unsure which boot and outsole would be best on that particular day, try different boots before kick off or in your warm up. A little jogging with some light twisting and turning will give you some idea if your boots are good for those conditions. Ask yourself are they comfortable? Is there enough cushioning when pounding the ground? Is there enough grip and traction? Like all good footballers, be prepared; always have a second pair of boots on the touchline in case you may need to change.